NEW YORK, NEW YORK, USA, April 16, 2019 /EINPresswire.com/ -- Survival in the FX brokerage business could be a tricky endeavor, after all an ever-changing regulatory environment coupled with sharp and unexpected market moves can make it difficult for FX brokers to service for a long time. For over 15 years FXDD managed to navigate this harsh environment to become one of the very few pioneering brokerages that are still standing on a solid ground. Success for FXDD didn’t come easy and it is even harder to maintain. One reason for FXDD’s continuous success is the prudent guidance of CEO Joseph Botkier who have been at the helm of FXDD for the last 14 years. Mr. Botkier wisdom and market experienced helped FXDD tremendously in navigating the tricky retail FX industry and staying ahead of the curve and expecting the unexpected. Another reason for FXDD long lasting success is its commitment to provide world class customer service to its clients across the 5 continents. The dedication and commitment of FXDD customer support team was recognized numerous times at the various FX venous that FXDD took part in during the past decade or so. “Best customer support Team”, “Best knowledgeable support Team” and “Best overall broker” to name a few are some awards that FXDD has obtained during its participation in trade shows and conferences across the globe. From the Far East to the Middle East, from Australia to Europe FXDD was recognized numerous for its exceptional customer support team. 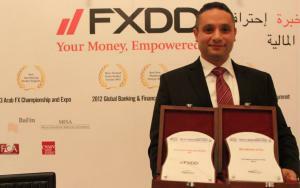 One place that FXDD did exceptionally well was the Middle East, one of the fastest growing regions for FX brokers. FXDD was one of the pioneering firms that entered that market back in 2007 and established a noticeable footprint. From Jordan to Egypt, Saudi Arabia to UAE FXDD team travelled the region holding seminars and webinars focusing on providing proper FX education and introducing FX trading as a reliable alternative for local market trading. 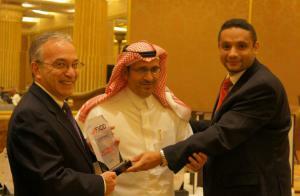 FXDD was recognized in Saudi Arabia, the country with the biggest market share in the Middle East region, numinous times. It was awarded the prestigious “Best FX broker” and “Best FX Customer service” awards by His Royal Highness Prince Dr. Saif AL Islam Bin Saoud. The recognition of FXDD excellency was not limited to tradeshows and public events only, a larger follower online and on social media ensures FXDD supremacy in the region amongst all FX players in the region. FXDD maintains its unwavering commitment to provide its clients with exceptional customer service experience going into the future to build on the decade long story of success.